Finding the right rug for your college dorm room shouldn't actually be a very difficult task because practically any college dorm rug will be better than that cold, hard dorm room floor. Whether it's wood, carpeted, or some sort of tile material, dorm floors are really never very conducive to bare feet—that's where having a dorm room rug comes in. This Lime Peace Rug is exactly what's needed to give your feet a comfort boost after walking to and from class several times a day. With this American-made rug, you also won't feel the need to keep your shoes on in your dorm room—and what could be more un-homey feeling than leaving your shoes on in your own room?! As you probably noticed, this rug for college has cool little peace signs all over it. Already lime green is the kind of color that has no trouble being the showcased centerpiece of your dorm room, yet those cool little peace signs give it that extra decorative detail to further enhance your dorm room decorations. Dorm rooms are small and there's really only so much you can do as far as making your dorm room look cool. 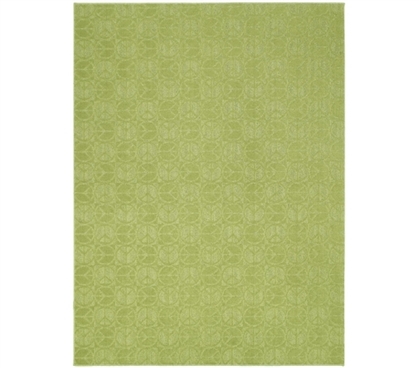 So make sure your college supplies include a dorm rug like this Lime Peace Rug. Remember, a small (and, obviously, a large) college dorm rug can really go a long way. All that empty floor space is just waiting to be covered in something comfier and better-looking!